Simple, stylish and understated. We love these glass water bottles made from recyclable materials but more importantly, their story moved us. These bottles are manufactured by Soma, a socially responsible company that strives to be as sustainable as possible and are on a mission to end the global water crisis. 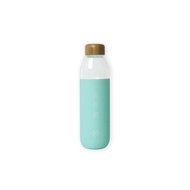 We’re excited to bring you a series of HICxSoma water bottles that will keep you elegantly hydrated throughout the day! Available in three colours - mint, grey and white. Each design is accompanied with a quote to keep you mindful of life on the lighter side.